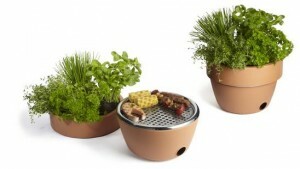 BBQ and herb-garden in one, very good for small balconies and gardens. Smart way to hide a BBQ (when not in use) below the plants. You can buy this on Amazon, fonq.nl or on Black+Blum.